...to crawling!!! I suppose it's only a few more weeks until he really starts going! Time to baby proof! 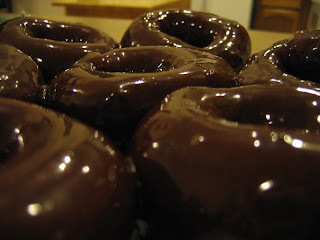 I was watching the food network the other day and Paula Deen was having a everything chocolate show, so I recorded it because it looked so yummy and I wanted to try the donuts. I had to search her web site for the donut recipe because it was easier than writing everything down while I was watching. 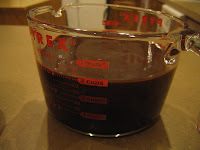 Now, I sometimes have a tendency to mess things up...even if I follow the recipe. I followed all of the instructions, but I would do one thing different when making the actual donuts. I should have used clean oil. They tasted like french fries because we like to make home made french fries, and I suppose I could use a different type of oil if I wanted to. 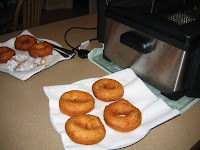 But the donuts were very easy to make and form and cook. The chocolate sauce was a bit harder. It looked really easy when Paula and her son made it, so I thought there was nothing to it. Well, when it was done cooking, it looked way too runny, maybe I didn't cook it long enough, I don't know. So I ended up adding a lot more powdered sugar to thicken it up. It wasn't quite right, but the overall donut was a bust because it tasted like fries. Oh, and I had waaaay to much sauce left over for the amount of donuts anyhow. Maybe I'll get adventurous some other time, but probably not, since it is cheaper to go and buy whatever kind of yummy donut you want. And there is a lot less mess to clean up when you buy! Hey, maybe this can be a loophole! I think, well, Michael came up with a way for me to have a profile viewable for me and everyone else to see. 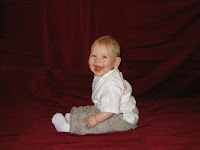 So I created another account that we have attached to our family blog. So hopefully this will work....we shall see. I now have to remember who to log into if I want to leave comments places so the right profile sends people back to our blog. 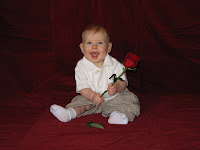 Luke is growing up way toooooo fast! We just can't believe it! I guess now it's only a matter of time until he is crawling all over the place! 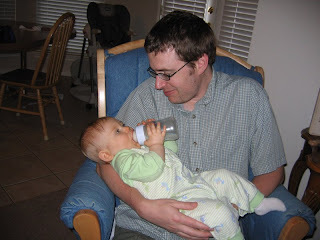 He has also learned to hold his own bottle, I'm not quite sure when or how he learned to do that because he rarely gets bottles. But it's pretty cute I think! Little teeth buds! Look at those teeth coming in! You can just hardly see them, but they are there! I can feel them, I have felt them since Saturday. And he is letting us know how he feels about them, loudly! Actually since I have really nothing to compare Luke's teething to, I would say that for now, he is just as cranky teething as he is cranky when he gets overly tired! 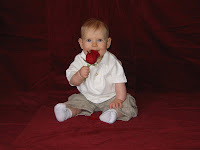 Note: No babies were harmed in the making of these photos (I took all of the thorns off the rose). I can now feel that his teeth have poked up out of his gums, and they feel sharp! He was really cranky today, I'm sure that will be the norm for a while, but we keep his little teething things in the fridge and swap them out. We had three teething things...now we have two...Ender happened to get one! I guess as Luke gets older he will learn now to leave his toys around or they may get eaten! Soon Luke will be cranky beyond all cranky. Soon Luke will not be sleeping well. Soon Luke will have some teeth! I noticed yesterday that I could start to see some little white bumps in the bottom front of his gums. Today I took a spoon and was lightly tapping on his gums, and when his tongue wasn't in the way, I could hear the spoon clinking on his soon to be teeth! Too bad Costco doesn't sell huge things of baby orajel! I can't believe how big Luke is getting. On the 12th he will be 6 1/2 months old! On the napping front....he is doing pretty well. He will take about 2 or 3 naps, which is pretty normal for some 6 mo. olds from what I have been reading. We love that Luke is in bed about 6 or 6:30 and that he will generally sleep until 6:30 or 7 in the morning! We have been walking this week after breakfast, we try and have a walk about 8 am. If we go and walk in the morning before it gets too hot, we don't have to go out the rest of the day if we don't want to! It's been really nice this week, just to be able to be at home and work on firming up Luke's schedule! Glad that April is over. Even thought April was a shorter month, I am glad it's over. Too bad May is starting to turn out like April...expensive! We got our slab leak all fixed and under control, now all I have to do to wrap that up is send a copy of our receipts from the plumber to the water department and they will reimburse us a little for the leak. We have a little of a drip, drip, drip, dripping water in the refrigerator, looking into having someone come and fix that, too bad we didn't buy the extended warranty for the fridge we bought just over a year ago. Our AC is on the fritz. I noticed last week that it wasn't cooling the house, even after running non stop for over 5 hours. Well, come to find out that has a leak too! We had the AC people out last year to fill the unit with refrigerant since it hadn't been serviced since we moved in, and we were surprised that this summer that it needed 6 more pounds of refrigerant. Which meant that there was a leak. A rather large leak. So we will wait until the refrigerant leaks all out, we are hoping that we can ride out what's left and that it will take us through the summer (I know, that's asking a lot!). After there is no more, we will be replacing the AC unit. We could have just replaced the part that was leaking and with the new part, had a 1 year warranty, but for a little bit more, we get a whole new unit with a 5 year warranty. And knowing our luck, and the fact that we will be here for a few more years, we are going with the 5 year warranty! Things come in three's, yes?! Well, you would think then that we have paid our dues and we should be done for a while....wrong! We were on our way home Saturday and we had a tire blow out! It sounded loud and we thought that there was one of those supped up cars or something with a huge muffler problem, but when a little PT Cruiser passed us and the noise was still there we pulled over and surveyed the damage. So, we got 4 new tires for the car (that means that with in the last 6 months we have replaced 6 of the 8 tires on our cars). I guess the fact that we needed new tired anyway makes it a little easier to swallow, and we were just glad that it didn't happen on Michael's way to work, because today he started his commute to Farmers Branch (a little over an hour each way), and we were glad that it wasn't raining, or snowing, or dark, and that we did have the spare in good condition, and that everyone was okay, yada, yada, yada...And people ask me if I get bored all day at home...nope, not with all that has been going on here! But... I am happy to report that other things are going well here, Luke is just getting cuter everyday (I will get to posting pictures soon, we have to back up the computer before that has problems too!) 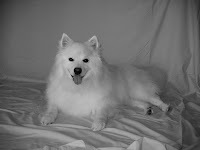 and we are really enjoying having him in our family. Luke really likes Ender and Ender is learning fast to stay away from Luke's little fingers that are now grabbing everything in sight! 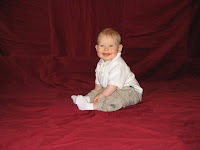 And Luke is working on learning how to sit up all by himself!